Samsung Electronics on Tuesday announced that it has begun the mass production of the industry’s first 512-gigabyte embedded Universal Flash Storage solution for use in next-generation mobile devices, using the firm’s latest 64-layer 512-gigabit V-NAND chips. Consisting of eight 64-layer 512-gigabit V-NAND chips and a controller chip all stacked together, the new 512-gigabyte eUFS doubles the density of Samsung’s previous 48-layer V-NAND-based 256-gigabyte eUFS, in the same amount of space as the 256-gigabyte package. The eUFS’ increased storage capacity will provide a more extensive mobile experience, according to the company. For example, the new high-capacity eUFS enables a premium smartphone to store approximately 130 4K Ultra High Definition video clips of a 10-minute duration each, which is about a tenfold increase compared to 64-gigabyte eUFS, which allows storage of only about 13 video clips of the same size. 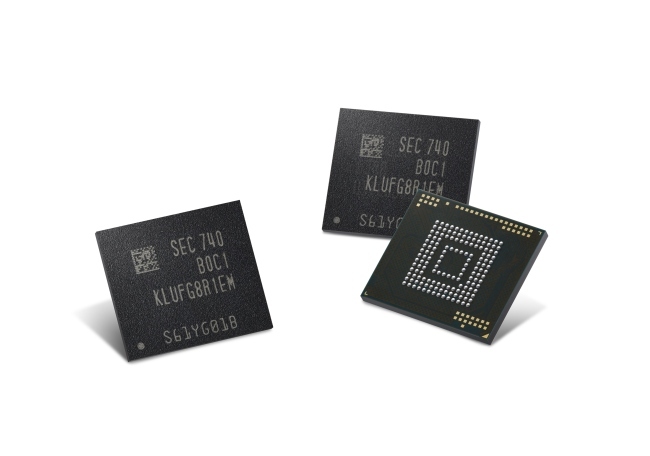 “The new Samsung 512-gigabyte eUFS provides the best embedded storage solution for next-generation premium smartphones by overcoming potential limitations in system performance that can occur with the use of micro SD cards,” said Han Jae-soo, executive vice president of memory sales and marketing at Samsung Electronics. Samsung plans to steadily increase production volume for its 64-layer 512-gigabit V-NAND chips, in addition to expanding its 256-gigabit V-NAND production to meet increasing demand for advanced embedded mobile storage, as well as for premium solid-state drives and removable memory cards with high density and performance.